Mac OS X includes many high quality voices for it’s text-to-speech abilities, they’re in a wide variety of languages and accents and are probably some of the best computer rendered voices out there. But guess what? Many of these incredible voices are not installed by default on a Mac! Thankfully that’s easy to change, and we’ll show you exactly how to add new voices to the Mac. That’s all you need to do, just let the voices download and it will become a selectable option in that previously mentioned Voice menu. You can add all the voices if you want, though be mindful of storage capacity on the Mac when doing so. You’ll notice that each of the high quality voices are somewhat hefty downloads, so if you have limited disk space you may want to just pick one or two new voices rather than adding the entire lot of them all, which take up several GB of data. You can also add new voices from the VoiceOver Utility, but going through System Preferences dedicated Speech / Dictation control panel is the easiest way. The high quality voices are one of the many new great features that arrived with Lion and Mountain Lion, and are now default in all modern MacOS and Mac OS X versions. Once you have added a few, you can test out the new voices and what they sound like with larger phrases, documents, or whatever else you want spoken, by using the standard text-to-speech methods of making your Mac talk to you, either through compatible apps like TextEdit and Safari, or by using the command line ‘say’ utility. It should be noted that other voice options are available in many different versions of MacOS and Mac OS X, though in new versions of macOS the Speech control panel is labeled as “Dictation and Speech” and older versions of Mac OS X label the control panel as “Speech”, but the voices are there in any vaguely new release ever since we got a sneak peak at some of the newest voices that arrived way back with Lion, but now they’re accessible for everyone to add to Mac OS X as long as you are running 10.7, 10.8, or newer, and yes that includes everything modern too from Mavericks, El Capitan, High Sierra, Mojave, and onward. If you have tips or tricks regarding adding voices to the Mac, share with us in the comments below! Is there a way to remove a voice after you have added it? Unselecting the voices in Preferences doesn’t delete the voice. cant find them in /System/Library/Speech/Voices/ sure is it the correct location of these files? The French Canadian is exceptionally well done, sounds very authentic both the male and female voices. I downloaded a few voice files, and it took quite some time to download. Does anyone know where the voice files are installed? I have more than one machines, and do not want to download these files for each machine or each time a machine is re-installed. “for it’s text-to-speech abilities” – please remember that “it’s” means “it is.” The possessive form of “it” is “its” and has no apostrophe, just as “his” and “her” also have no apostrophe. Problems: I keep getting; not connected to the internet when I try to download my location (Danish, Ida). I’ve been trying to Download “Daniel” for a week now, and that server keeps timing out with just a few GB to go. I love the new voices. The international languages are excellent. It is especially useful me living in Thailand and when I chat with my friends in Thai, instead of me having to trust an often incorrect translation using Google, I simply select the text I want to understand and hit the hot piece. Since, I already can speak and understand Thai, but cannot read it (very complex), it helps me a lot. Does anyone know if it’s possible to force OSX 10.6 to accept the new voices? I’ve downloaded Daniel for my MacBook Air on 10.7.5 and he works a treat – I copied the files over to my iMac on 10.6.8. I put them in the Voices folder, then backtracked and also left them in the Speech folder. However, when I go back to the Clock settings and the Speech settings, the voice is not available in the list, even after pressing ‘show more voices’. I’m guessing the new voices are handled differently and therefore aren’t compatible. But has anyone had any success using them on a machine before 10.7? Thank you this has made all the difference when listening to the e-books that I have downloaded and all the complicated technical papers too. I have finally found a voice that does not make me want to throw something especially when getting a reading of my draft papers. I’m making a simple program that involves voices. Is there any way I can add custom voices besides the default custom ones, since I want voices from a game called Team Fortress 2? If it can be done, could you please tell me. These instructions don’t work for me because there is no “Customize” under “System Voice” drop-down list in “Snow Leopard 10.6.8”. If anybody knows how to do this, please let me know. Thanks, Garry. I have a problem with downloading new voices. I’m trying to install a Swedish voice (have tried downloading both). After accepting the downloading and installation of anyone of them (and the license agreement), the progress shows that it’s searching for the voice. Then I get an error message that (in Swedish) “The update “Multi-Lingual Voices” can not be installed. An unexpected error occured”. I don’t know where to go from here. 2) Open this file with a text editor (e.g. TextMate) and search for the voice you want to install (e.g. in my case the German Steffi). The language files are labeled with the prefix MLV__… – You can skip the rest. The only thing you need to find is the download URL for the required voice. In my example the search term was: “MLV_de_steffi”. 4) Open the URL from 3) in a browser and your Mac should start the download of the voice right away. After this your new voice should be available without any additional steps. 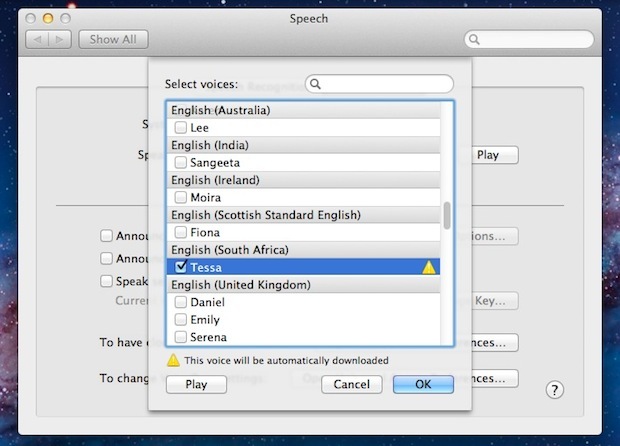 SYSTEM PREFERENCES > ACCESSIBILITY > SPEECH > System Voice dropdown, select Customize. Or, you could have searched “Voices” from the System Preferences main screen, and it would’ve brought you right there. But, who wants to take the obvious/common sense route when you can scour the Internet into the depths of an article comments section, nahh’msayin? You are missing a step for the new Mojave OS for those with the newest OS. To be able to change the voice you wish to use, you will have to go to “Accessibility.” Go to “General,” and there you will see a list and the “Speech,” button is the fourth one down. Go there and now you can change to whatever voice you wish to use.